Vietnam is a country of extraordinary extremes and distinctive experiences. Clodagh from Corrib Travel visited this amazing country in November, a destination on her bucket list for a while. "We flew with Emirates and our first stop was Hanoi, the first thing to hit you is the sheer amount of motorbikes," she said. "The whole city is full of them and the trick seems to be how many people or things you can get on one bike at any one time. We stayed in the Old Quarter, a great location with plenty of shopping on our doorstep with any amount of 'genuine' fake North Face jackets, designer bags, and branded runners. Bargaining is part of the culture here. "We travelled down to Halong bay, a beautiful natural wonder where we had a full itinerary laid out for us the day we arrived, including sailing around the amazing limestone structures, monkey inhabited islands, and visiting endless caves by bamboo boats. We stayed overnight onboard La Vela Cruises. "Next on our itinerary was the city of Da Nang, just over an hour's flight from Hanoi. I stayed in the five-star Beachfront hotel, my villa came with a private pool and included two spa treatments every day. The hotel has an infinity pool overlooking the beach. 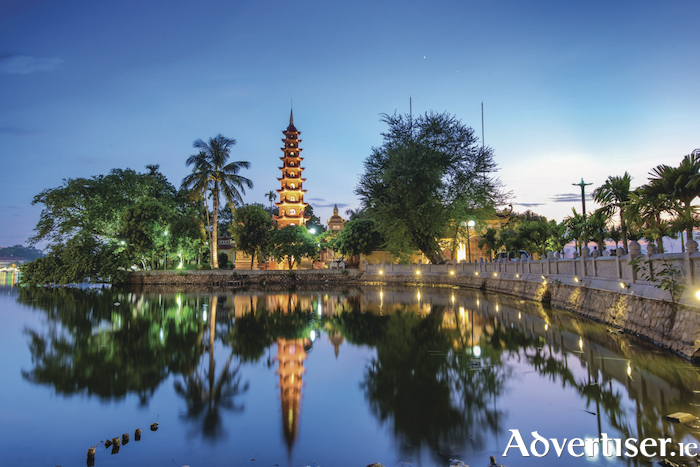 Da Nang is the gateway to the ancient town of Hoi an, where the cobbled streets to the Japanese Bridge and Chinese Temple to the lanterns make this town very attractive. "Our final destination was Saigon in the south of the country, I absolutely loved it here – very western and fast paced. While here we did a Vespa tour, and got to experience the buzzing streets while weaving between cars and motorbikes, we travelled by speed boat and visited the Chi Chi tunnel, this is a must and a real eye opener. I stayed in the amazing five-star Reverie Hotel, the only member property of The Leading Hotels of the World in Ho Chi Minh City." Vietnam is changing and growing in interest from international tourists at a rapid rate. There is no doubt that now is the time to visit. So, call Corrib Travel at 091 564713 and let the team organise this trip of a lifetime for you.